WHAT IS THE SUPLEKS DATABASE? The Supleks Ramen Database is generally held to be the largest-scale, most comprehensive ramen-related web site in Japan. The site holds a huge database of Japan ramen shops organized by location and type. It permits registered users to post comments, rankings and pictures on the site for the shops that they visit - the site then stores the rankings and allows users to sort and search through the list of shops using their locations and rankings as a guide. The site is well-integrated with Google Maps and you can easily see what shops are in each area, how close they are to the nearest train station, etc. As of this writing, in the Supleks database, there are 19731 shops throughout Japan, 5730 of which are in Tokyo. We have no idea where the word “Supleks” comes from or what it means. Yes we know there’s a word “suplex” used in wrestling but we don’t see what that has to do with ramen, but hey this is Japan so who knows. Admittedly, Ramen Tokyo will never ever even approach the scale or depth of Supleks. So this page is a basic attempt to explain to non-Japanese speakers how to use some of the features of Supleks, so that you can also use it by yourself to find new shops and enjoy ramen in Tokyo. 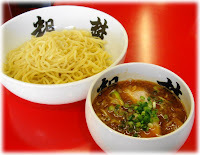 - What is the ranking of a particular shop that I have read about on http://www.ramentokyo.com? 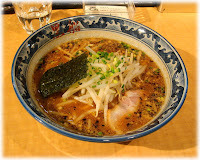 - What are the main areas for good ramen in Tokyo? By good we mean not any one shop in particular but an area that is largely walkable and has a relatively large number of high-ranked shops. however we cannot promise a reply, speedy or otherwise. - You will need to know a tiny bit about Japanese addressing, meaning prefectures, wards, neighborhoods, and how street addresses are formed in writing. We’ll try to handhold as much as we can on this doc. If you want to search the database directly by area (prefecture, ward, city or named neighborhood) you will need to know how to write that area’s name in Japanese (you will need to know the exact kanji or hiragana, “close” isn’t good enough). If you don’t know how or want to do that then you will still be able to use this guide, as long as you can find your location on Google Maps. - If you want to enter Japanese addresses directly into Supleks, We recommend you test the characters out in Google Maps Japan first to verify that they are correct and take you where you want to go. While you will need the Japanese fonts on your PC, you won’t necessarily also need the Japanese IME (I’m assuming you are using a Windows PC, We don’t know what the procedures are for Linux/Unix, Mac or other operating systems), if you can find the Japanese characters elsewhere on the Internet and use the Windows Copy (highlight them, then right-click, Copy) function to copy them. - If you want to write the characters yourself then of course you will need the ability to enter Japanese Kanji characters on your computer. I am not familar with the process of doing this for Macs, however for Windows PCs, searching in Google for “Windows Japanese IME installation” or similar phrases should lead you to an explanation of what the IME is for Windows and the installation instructions. There is no cost for the IME, it comes with Windows, but you may need your Windows installation disk. We cannot help with the installation or support of the IME. If you use Linux then you probably already know what to do. Copying and pasting the Japanese characters from another site on the web, e.g. Wikipedia, should work fine in 99% of the cases, if you have the fonts installed. - A general familiarity with Google Maps Japan is very helpful. - Any necessary Japanese characters other than the above we will put into this page. - Although in general we find Supleks to be a very good guide, we don’t vouch for any particular recommendation that they make. RANKING – takes you to the page where you can put in parameters like soup type, type of ramen, or period of time (in the past) and generate lists of what shops are/were the leaders. then it will take you to the specific page for that shop, with all of the details. Now see the next section to read how to interpret that page. 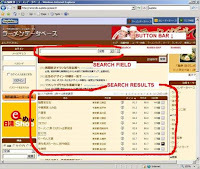 Clicking Search now will give you a listing of all ramen shops in Shibuya-ku, ordered by ranking. There will still be a lot, in this example 200-300. This will give you a listing of all shops in Yoyogi (in Shibuya-ku), in this case there are 24 of them. In this case we have typed in the characters for Rokurinsha, a popular shop in Oosaki, Shinagawa-ku. Now when you click Search this time, a number of shops may still display, because the comments and descriptions for some other shops may reference this shop’s name, and the Search function appears to search in all information (addresses, comments, descriptions, etc.). But the shop you are looking for should be at or near the top of the list, if your Japanese characters were correct. After you get a list of shops via the above procedure, refer to the SHOP LISTING RESULTS PAGE above. The listing contains the highest-ranked shops in the country. Typically you will want to filter on some city or prefecture, so use the picker at the top, the one with 全国 in it (= “nationwide”) to perform Step 1 in the RAMEN SHOPS IN A PARTICULAR AREA section above in order to filter on location. After you get a list of shops via the above procedure, refer to the section SHOP LISTING RESULTS PAGE. In order to see the highest ranked ramen shops in the past, first click the Ranking “ランキング” button in the upper right on the brown bar, to take you back to the base Ranking page. Then click on the appropriate button or pull-down on the right according to the below – the values in the pull-downs should be self-explanatory when you see them. The listing contains the highest-ranked shops in the country. Typically you will want to filter on some city or prefecture, so use the picker at the top, the one with 全国 in it (= “nationwide”) to perform Step 1 in the RAMEN SHOPS IN A PARTICULAR AREA section above in order to filter on location. After you get a list of shops via the above procedure, refer to SHOP LISTING RESULTS PAGE. In order to filter on noodle type (see below), first click the Ranking “ランキング” button in the upper right on the brown bar, to take you back to the base Ranking page. Then click on the appropriate button or pull-down on the right according to the below – the values in the pull-downs are translated below. Typically you will want to filter on some city or prefecture, so use the picker at the top, the one with 全国 in it (= “nationwide”) to perform Step 1 in the RAMEN SHOPS IN A PARTICULAR AREA section above in order to filter on location. After you get a list of shops via the above procedure, refer to SHOP LISTING RESULTS PAGE. More and better definitions of the above are on the Ramen Tokyo Ramen Glossary page. I recommend that you also make sure that the broth type you are interested in does not have any items in it that you do not eat (dietary, religious reasons etc.). 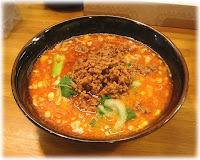 For example, sometimes miso ramen broth can be made with miso paste and chicken broth, therefore it might not be appropriate for some types of vegetarians. This screen works like the regular Google Maps page and you can use it to find ramen shops. Scroll, zoom in and zoom out, it all works the same way. Each gold star represents one shop. You can left-click on any star to bring up a quick balloon containing information such as the shop name and address. In the balloon, click on the shop name to go back to that shop’s DETAILS PAGE. (I recommend that you actually right-click on the shop name to open the page in a new window, that way you can keep the main map window open as you scout a particular area). Sometimes you will need to zoom in and scroll around a bit to get your bearings. Use the picker on the top right to sort the shops on the list below (lower right) by proximity to the map center or by point ranking. Once you sort by point ranking (ラーメンポイント), the top shop on the list below is the best-ranked one on the map. So center the map on your hotel, or the station you are at, and then use the point ranking list to see what’s best or closest.